The January 12 New York State Sportswriters Association Poll shows two Section 2 teams in the top twenty. Lake George is the number one state team, and the Hoosick Falls Panthers are three spots below at number four. Those two teams are scheduled to meet Sunday, January 27, at the Cool Insuring Arena in Glens Falls. Lake George will almost certainly enter the game undefeated with games against Cambridge and Corinth scheduled before the meeting. 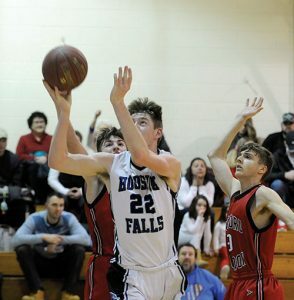 Hoosick Falls faces Mechanicville on Friday, January 25. The Panthers defeated the Raiders earlier in the season in a tough game, 56-52, but Mechanicville has been squeaking out its wins recently, so there is a good chance both teams will enter the contest undefeated. The game starts at 5 pm. There are four games prior to the HF game, beginning at 11 am. At the arena website, ticket prices are listed as $10 for adults and $6 for students. Monday, 1/21. After falling behind 10-1 with two minutes left in the first quarter, Waterford scratched its way back in the second quarter to take a 22-19 halftime lead. With the Panthers playing their worst game this season, with sloppy play and multiple turnovers, they slowly overcame the deficit to retake the lead and get the win. Dmitri Rose scored 16, Max Kipp had 15, Tristan Williams 13 and Jon Kempf added 10 for the Panthers. Friday, 1/18. The Tamarac Bengals held Stillwater to a second quarter two points and used that advantage until the game ended. Frank Zotto scored 14 points, Bo Catherwood added 12 and Jacob Defreest had 11 for the Bengals. Friday, 1/18. A five point third quarter doomed the Cambridge Indians chance for a win on this night. Leading at the half, the chance for the win slipped away in the third. Brian Hall led the Indians with 12 points. Wednesday, 1/16. Anthony Ciampolillo led the Tamarac scoring with 23 points, Bo Catherwood added 19 and Dan Honsinger chipped in 10. Kasey Billert scored 10 for Berlin. Wednesday, 1/16. Cambridge fell into a 31-14 hole at the half and couldn’t figure a way out, eventually falling to the Witches. Thursday, 1/16. Hoosick Falls set the stage for the game by holding the Saints scoreless in the first quarter. From there, the Panthers cruised to the win. Jon Kempf scored 21 and Tristan Williams added 20. Thursday, 1/10. Roman King scored 13 for the Mountaineers.